Here are two videos that my coaches took of me shooting during the relay competition in Ruhpolding. Yesterday I got my first taste of biathlon mass start action at the World Cup level, leading off for our relay team in Antholz, Italy. It reminded me of how much I thrive on head-to-head racing. Usually our races have an individual start, so during the race I never really know how I am doing compared to the rest of the field and it is just me versus the clock. I like having a person right in front of me to chase; I find that much more motivating than the ticking of the clock. 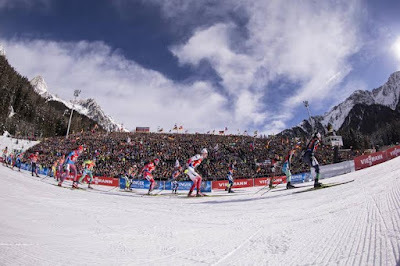 Relay start in the sold-out Antholz Biathlon Arena. My coaches decided to put me first so that I could have that head-to-head experience, both because it will be useful in the future for pursuits and mass starts, and because they thought I would like it. I accepted the challenge knowing that I could probably hang onto the pack on skis, but that I might get separated from the leaders on the shooting range even if I hit all my targets. A fast, clean prone shooting time for me is about 34 seconds from arrival on the mat to departure, plus another 10-12 seconds per spare round if I miss and I have to hand-load. I usually shoot standing a few seconds slower than prone. This week, the fastest standing shooting time was by a Bulgarian woman who came, shot, cleaned and left in 21 seconds. My time, with one spare round, was 56. That is a lot of time to make up on skis! I did pass six teams on my last lap, including the third-ranked team Germany! (See her right arm, above in the background!) I tagged off in 12th place, less than one minute behind 1st. Our team struggled on the range and moved back to eventually finish 17th. Today I got off to a great start, shooting clean in prone, and then I missed 3 in standing and my chances of making the pursuit (top 60) went out the window. I ended up 67th, just 12 seconds out of the top 60. The good news is I skied significantly faster than I have since World Cup 1 in November, so I actually would have made the pursuit if I had shot 80% or better. I have shot 80% in the last three sprint races but unfortunately I couldn't pull that off again today. To put things in perspective, even if I had hit 10/10 at World Cup 3 in December, I would not have finished in the top 60 because I was skiing so slowly. And yet at World Cup 1 in Novemeber, I hit 10/10 and finished 16th because I was skiing so fast. It is a mystery as to where the ski speed went, but I can only hope that now it is coming back! Then I can put all the puzzle pieces together. 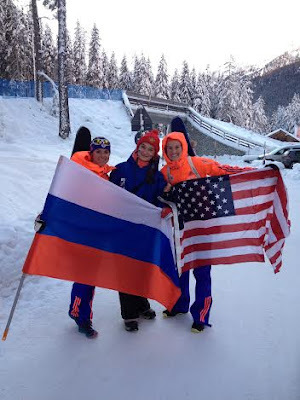 We have a women's relay on Sunday morning, and then I fly back to the US on Monday. I will find out after this weekend whether I have qualified for the next two World Cups, which will be held in Canmore, Alberta (CAN), and Presque-Isle, Maine (USA). Joanne and I with a young Russian fan. Following a Czech skier on the first lap of today's sprint. The Tyrollean hot chocolate (pudding!) is so delicious I eat one every day. This is the view from our hotel, overlooking the Antholzersee. Yes, it's true. A great place for a walk or a ski. We wrapped up our second week in Ruhpolding and are now in Altholz, in the Italian Dolomites, gearing up for World Cup 6. Antholz has two names-- it is called Anterselva in Italian, but the local language is German (or a dialect of German), hence Antholz. I got off to a rough start in the Individual, missing one in the first prone stage and then three in the first standing stage. There is a one-minute time penalty per miss in the Individual so with four minutes of time penalty incurred, I knew I needed to put together a better second half of the race... and I did! I hit all ten of my remaining targets. This was a huge accomplishment for me because if I had let the bad first half of the race get into my head, the race could have cone downhill fast. Instead it got better and better. My result was still not good (74th) but I was happy with the turnaround in the shooting, and I actually felt a bit better skiing too. I shot really well in the relay, missing only my last target! It is always a let-down to miss the last shot, but I am still content with 9/10 shooting, and I hit the missed target with my first spare round. (In relays you are have three spare rounds per shooting stage if needed.) Unfortunately I am still skiing slowly, so despite good shooting, I only moved our team up a few places. My teammates did not have stellar days and we finished 16th out of 22 teams, just shy of our most recent 15th place relay finish. 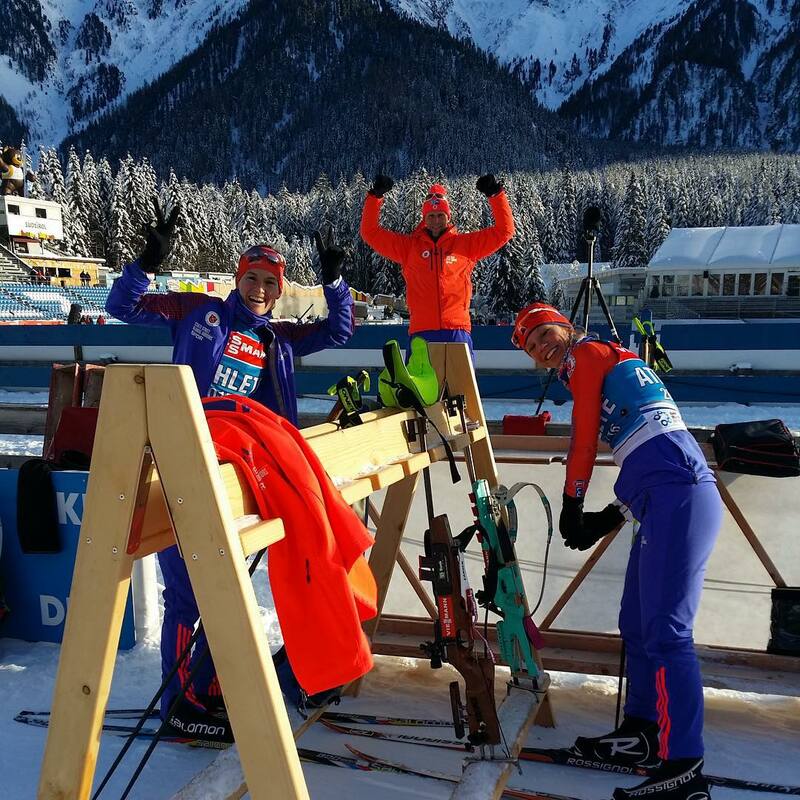 Here are some pics from Ruhpolding and Antholz! 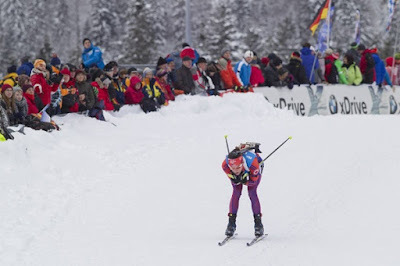 Susan took 6th place in last week's mass start- her best finish in that event! and a little "I love Norway" moose. I gave him a signed race bib. The course last week before it dumped several feet of snow. Post-snow storm. Tucking past the crowds in the relay. Cresting the steepest hill in the relay. Lowell bravely captaining our van to Italy, keeping the windshield clean en route. Benvenuti in Italia!!! Cold, snowy and sunny. This week's World Cup was supposed to take place in Oberhof, Germany, but it was relocated to Ruhpolding, Germany due to lack of snow. So now both World Cups 4 and 5 are in Ruhpolding and we have set up camp here for two weeks. There is a campground with a laundry machine next-door to our hotel, so as far as I am concerned we should stay here as long as possible. 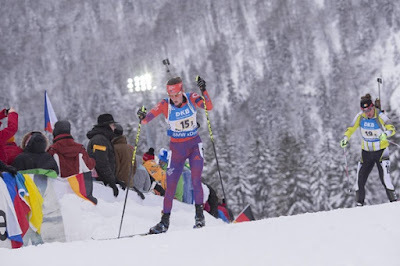 Yesterday's sprint race was similar to my races in Hochfilzen and Pokljiuka-- I shot well and skied slowly. 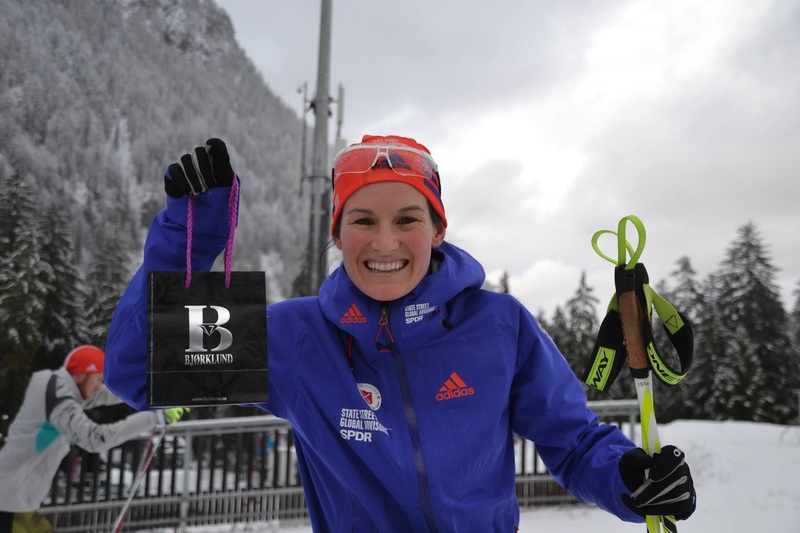 I missed 2 in all three races (1,1 in Hochfilzen; 2,0 in Pokljiuka; and 0,2 in Ruhpolding) so I have now achieved all three shooting combinations for a total of two misses, and am ready to move onto 1 miss! I am pushing hard on the course and working on the technique points that my coaches suggest, but I just don't have the energy, speed or power to compete with these women. We are trying to remedy as quickly as possible. I am hopeful that the key will just be to race more in order to shift out of third gear and into fifth. Unfortunately it is hard to race more when you don't qualify for the pursuit. 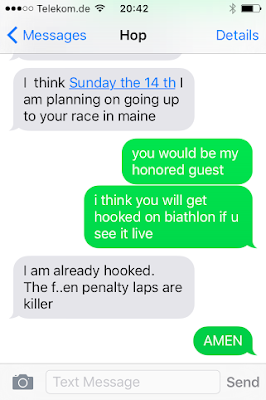 Next week, though, I will have two opportunities to race-- an Individual 15k on Thursday and a team relay on Sunday. I have lots of training between now and then. My college running coach hit the nail on the head! How did that go by so fast?? After World Cup 2 in Hochfilzen, we traveled to beautiful Bled, Slovenia for World Cup 3. The venue is a half-hour drive up a winding mountain road from Bled, in a place called Pokljiuka. 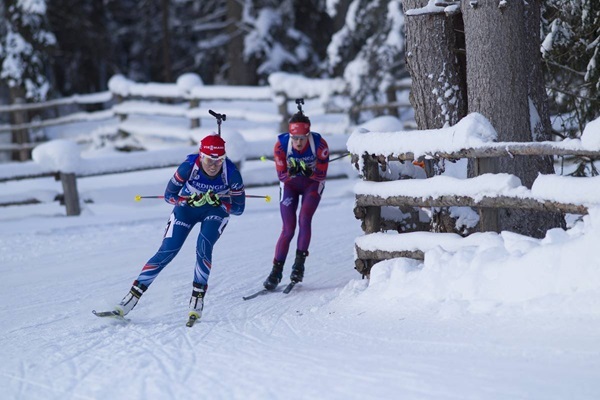 My parents came to watch this event and very much enjoyed the scenery, biathlon racing, and local wines. Bled is a fairytale city on a lake, with one castle on a cliff and one on an island. As for the racing, I had another week of solid shooting and slow skiing! After missing two in prone, I knew I had to hit my standing targets or else I would have no chance of making the pursuit (top 60). I took my time on the range, and for only the fourth time ever in a race, I hit all my standing targets! But little did I know I already had no chance at the pursuit. Even with clean standing shooting I left the range in the high 70's and eventually finished in 85th. I can only hope that my body will feel rested and ready to go faster after Christmas. Then I had a much-needed break! On Sunday night after the last race in Pokljiuka, I attended the US Biathlon Christmas party at the Hirzinger Hotel and Restaurant in Riedering, Germany. It was so special to be with all of my hardworking teammates and staff in a non-work environment (i.e. party). We feasted on duck and Kaiserschmarn, drank lots of Weisbeir, were serenaded by a bavarian brass quintet, and sang Christmas carols (Stille Nacht, Oh Tannenbaum) long into the night. Many of our staff hail from Bavaria, so as is customary for formal events in the region, the dress code was lederhosen for men and dirndl for women. Then I reconvened with my parents in Innsbruck, Austria, where we were joined by my younger brother Graham! I did not travel back to the US for Christmas but instead my family came to me-- minus my older brother Guy who is living in California :-(. This was great for me, because I avoided the arduous travel, and great for them because they got to go on vacation. Innsbruck was a fun foray into an urban setting for a change. Then we went to Lech, Austria which is an alpine ski resort in the Alberg region of western Austria. My cousin Cecily and her husband Thomas live in Austria and recommended Lech to us, as Thomas worked there for many years. They joined us for several days at Christmas and were great guides. It was a spectacular place for skiing, even with little snow. Cecily and her dad (my Uncle David) can be credited with taking me cross-country skiing for the very first time when I was about 12 in New Hampshire. She also skied with me every day and Lech! View from the top of one of the gondolas. Endless skiing! After a week in Lech, I headed to the Italian Dolomites for a week of "training" with my boyfriend. We were in Antholz which is yet another magical place. We enjoyed New Year's Eve and his birthday together. To sum it up, I had a very, very nice break. Now it is back to work! The women's sprint is at 2:30pm local time on Friday here in Ruhpolding, Germany.